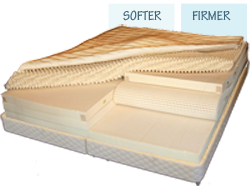 Each Sleeper has two to three layers of latex which can be arranged and rearranged to achieve the firmness that’s “Just Right” for YOU. Simply unzip the luxurious cover of your latex mattress, fold back the convoluted pressure relieving latex comfort pad and change the order of latex cores. With 5 different ILDs ranging from Soft (22 ILD) to SuperFirm (44 ILD) you are guaranteed to find the firmness your body needs. Top it with a super-soft Talalay topper of 2 inch convoluted latex and you’ll never look back. In a FloBed, there’s no more comfort compromise between sleep partners! Each side is individually constructed to accommodate each sleepers’ firmness needs. Need to address specific pressure points? With the vZone Mattress you can make it softer or firmer any where you need it… from Head-to-Toe. Need extra lumbar support? Each zone fits into a zipperd pocket of the organic cotton vZone encasement and can be moved to get the zone pressure your lumbar/shoulders/hips need.